I love ice cream. It`s a fact. When asked what my favorite food in the world is, I reply: ICE CREAM. :) I eat ice cream all year around. Even when it rains outside. It doesn`t snow where I live, so I eat ice cream during the Winter season as well. Hehe. Since it`s summer and ridiculously hot...ice cream is a MUST. You don`t even know how sad I was when I realized ice cream was unhealthy. Which, was like a year ago. For some reason, it never occurred to me that this beautiful dessert is bad for you. I`m not sure why. Then, last year I got an ice cream maker and in making the custard/base for the ice cream...I was like, "THIS IS A LOT OF SUGAR!" But, it didn`t stop me. I made a different batch of ice cream almost every week for 2 whole months. Yes, I ate ice cream almost every single day during those 2 months. I love Biscoff cookies, so naturally I love the spread as well. So, this? Biscoff, in ice cream form? YES, please. I instantly knew I must make this. This ice cream is thick and creamy and it`s just great. 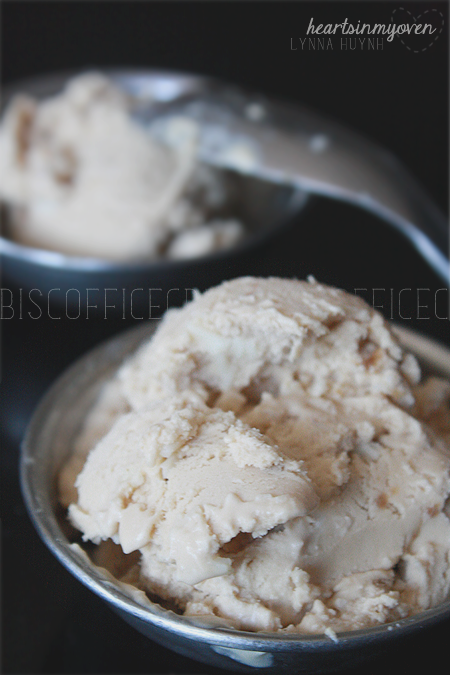 You can definitely taste the Biscoff flavor in the ice cream, which I love. 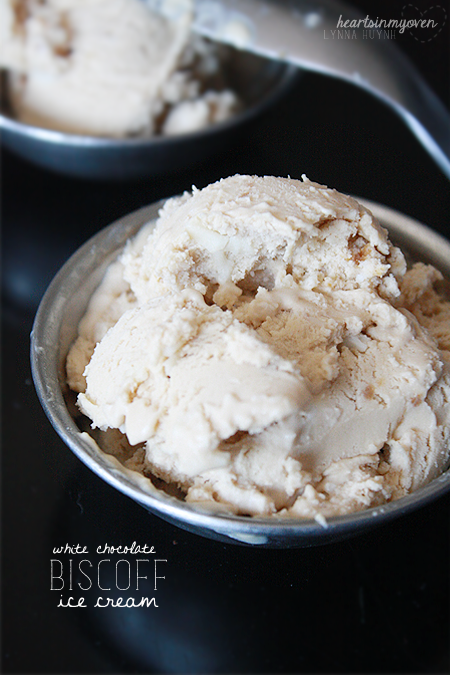 I melted some white chocolate chips and drizzle it into the ice cream to add a sweet crunch. 1. If your ice cream machine requires you to freeze your bowl ahead of time, do so. 2. In the large bowl of your electric mixer, beat together the Biscoff spread and sugar together. 3. With the mixer turned off, add the milk and mix very slowly (to not splash). Increase the speed slightly when the milk becomes more incorporated for about 5 minutes, or until mixture is liquidity. 4. Add in the heavy cream and mix until combined. 5. Follow your ice cream machine instructions in churning the ice cream. 6. Transfer churned ice cream into a container. Place a plastic wrap, touching the ice cream, before putting the lid on top. Freeze for several hours, about 4 hours or more, so ice cream can reach a better consistency.